Hello to all you devoted devotees, namaste, hi, buenos dias, ni hao ma, assalam-a-lai kum and all other expressions of greetings. Well well, it has been a while now that I did not say anything, but over the time, I have noticed some things, I mean a lot of ‘some things’. I want to share with you my keen observations and most of them happened before our very eyes and we really did not pay attention to most of them because they were a bit subtle, but you must know that these existed over the years. I have attempted to do this article before, but I always thought that the fans might not want to read it and kept cancelling it. Today, I have decided that I shall write and submit it for the fans so that they can be the judge of what I say here. Now, I stand to be corrected if I am wrong in any part of my contribution. I am a Trinidadian in the west indies and I can only rely on objective observation and subjective recall from memory to express my thoughts of everything about the GREATEST playback singer ever to walk on this planet … MOHD RAFI SAHEB, as compared to if I was a citizen of India. Many people might disagree with my article here and I do appreciate others expressing their opinions, but what my article explains is FACT and was not derived from emotions and as you already know; opinions come from emotion just as if one is walking on thin ice. I have to mention some names and it is only for references. (These were my personal favourite stars of the Golden era) Rajendra Kumar, Dharmendra, Shammi Kapoor Raaj Kumar and some more. During the times of these box office heroes, there was something. Whenever a certain voice played back for them , their screen image became enhanced to the extent that you felt as if a sudden burst of energy just came right out at you, This certain voice is that of the legend .. MOHD RAFI SAHAB. These heroes played imaginary characters on the screen and were the recipients of a voice that gave life to the characters they played. Now, a lot of these heroes have passed on and so too, maybe, the characters they portrayed , but the voice they lip synced to lives on. The owner of this voice is MOHD RAFI … [ THE REFERENCE STANDARD – THE BENCHMARK ] Rafi’s voice IS the bigger actor here. I tell you, this voice still evoke goosebumps on your goosebumps, come on don’t be shy, admit it. Sometimes in certain songs when he sings in the upper scale, or high notes, you feel the hairs stand out on your body as a reaction to the feelings that this part of the song is expressing and if no one is looking, you let your tears flow freely. Isn’t this the truth? Seeing this name in print or otherwise, “MOHD RAFI”, attracts attention and when his voice sings, the world listens and you live into another experience that becomes a part of you. A king, A Maharajah, a Nawab, A Prince, A Duke, a President, A Doctor, A Lawyer, A Scientist, A Prime Minister and a great multitude of others who should be mentioned here, carry many prefixes to their names ..eg – Doctor XYZ ..MBBS or Attorney Mr. ABC ..LLB..Phd. A scientist with the prefix: BSc…etc. This is all well and good, Now I am drawing a reference here to explain what I am getting at. Currently, many of us has to visit a doctor, or some other professional. We go in to see these people and while we are there, in the reception area awaiting our turn by a number system, we notice hanging on the walls the credentials of the professional person we are about to see and so many as much as a half of the entire alphabet lettering following their names. I know this is to identify the level of the professional’s learning, but when you walk out his or hers office, do you remember all this? By the time you gets back to your home you are still trying to remember where you went or what you did. You see names of all these professionals in bold lettering and it still does’nt hold your attention. However if you see even in the finest of prints just one simple name, a world of memories and nostalgia comes crashing down to you. Only one name. He officially wasn’t A President, A King, A Lawyer, A Doctor, A Maharajah , Sir, or Lord, A Prime Minister or any other of those with a half of the alphabet lettering following his name. His name is: MOHD RAFI SAHEB. Whether you like it or believe it or not, it is not easy as you think to ever forget this name .. except in the situation where one has been diagnosed with amnesia. If this be the case, I recommend that a Rafi’s song be played next to this person’s ears and in 10 seconds the amnesia will take a hike. Anyway, Isn’t this a 21st century truth as I say that when he sings, he supersedes everyone of the above mentioned professionals with all their “impression” creating letterings after their names. Me myself a mere mortal, that when I pass on, no one will remember me. I will not factor in anywhere except for.. maybe 10 people and I am gone forever, maybe you too. I think that his voice and talent had it’s own curriculum of song and comfort theory to the listener. I also think that his songs create a sixth sense in the well focused listener that invokes a feeling of a higher consciousness. Dear devotees and followers of this VERY GREAT SINGER.. MR. MOHD RAFI SAHAB , I have a extra large size problem here now. Many of the actors who were non-entities and were really having beans at getting attention for years on end without recognition just so happened that one day out of the blue and black, a fairy whomever, waved the “strike it rich” wand and abracadabra, this unknown aspirant was thrown in front the camera to lip sync a song by the biggest of all voices in cinema, and presto, he became an overnight star and success. Suddenly , he ranked in the top 3 actors profile and he became an overnight sensation. The truth is he acted in some movies and was given songs to lip sync on the screen but he never really hit it big time. He was still insignificant to the audience. His unlucky streak was that he was given songs which is all well and good, but he wasn’t given the VOICE. Eventually, he got the voice that was like a multi million dollar lottery to him and he never looked back … not even to see the footprints he left behind on his journey on the way to the top. Now, this is one of many of similar incidents that are real and did happen and is one of the “Riches to Rags” stories in the movie business. A lot of actors made it big time to the top and they all had it just fine. Now, this is where my problem comes in. I am wondering, if these people ever learned in school the meaning of the words: SOLIDARITY and RECIPROCATE . In the western side of the world most no one paid attention to the lame duck singers of the time, it was truly boring to see on screen youthful actors lip syncing to voices that sounded like “Old aged Pensioners”. Then suddenly, the movie “Junglee” with Shammi Kapoor came and we heard the songs on the radio and there was no turning back for me until the time where this part of my contribution is about. Junglees songs was a huge blast of teenaged youthfulness that was suddenly thrust upon us like a giant tsunami. I mention this today because this is a fact. Since Junglee, I became hooked to movies with this voice, to this day. People who do not look back to where they came from or the trail they left behind is a sorry state. Even dogs remember the hand that fed them, except the one that grounded me for two weeks in December last year. You might not know this but in my area here, people who behave like this are labelled as: “Namakharam” “Ingrates” “Ungrateful”. How can some ” People” be like this? You know, I shouldn’t ask this question as I already know that it is not everything that walks on two legs , has two arms, two eyes etc.. is to be considered a ‘Human Being’, when they only LOOK like a human being. Recently, I noticed a lot of yesteryear actors paying their ‘crocodile tears’ type of tribute to MOHD RAFI on the internet. I really must weigh in on these publicity seekers whose only intention is to draw some kind of attention to themselves. Some of them even has videos of themselves speaking about MOHD RAFI for 15, 20 and even 30 minutes at a time. Can you believe this ? Are these ‘people’ for real ? After all he did for them to get into the big times, practically all of them turned their backs when he needed them. These same people could have helped to preserve the true natural course of playback singing history in the film world. Then again, how can you trust them, when they only ‘LOOK’ like human. These very front runners top box office draw actors at the time did not have the guts (as if they ever had any in the first place) to exclaim to the movie people concerned that the great voice of Rafi helped put them where they are and if Rafi’s voice is not playing back for their screen image, then they will not be in the picture from then on. These top rated actors could have done this and my friends, this is what solidarity is about. I must add, the very same people his voice catapulted into the big time limelight are the very same people that backed and supported the perversion of the natural course of playback singing history. Remember, whenever anyone renders good, good follows. Before I punch my card out for this evening, I really must admit that I have never heard any singer who rendered songs in so many different styles and variations. I have listened to many western singers and I talk about the really big guns in the USA. They even sing in the movies in Hollywood and up to now, they ALL sound : ONE WAY, one style, even all those pop icons they blah blah blah about repeatedly as if they want to brainwash you, sound ‘one way’. I have proof of what I claim here that the only true versatile vocalist of a multitude of styles and variations IS MOHD RAFI. Thanks very much for allowing me to contribute to this platform. One more thing… there are some references that I have made and is pointing to many big actors in bollywood, because this is where it happened, then again, my references cannot point to let’s say Russia or France or Switzerland, because it did not happen there. This entry was posted on Monday, July 31st, 2017 at 1:52 pm	and is filed under Meri Awaaz Suno. You can follow any responses to this entry through the RSS 2.0 feed. You can leave a response, or trackback from your own site. I have to agree Soni Ji with what you have said, and yes that every one has an opinion, but on the same hand you can’t change facts. I too have been disappointed with a lot of the stars who to be honest would never have become huge stars had it not been for Mohd Rafi elevating their careers. Apart from a handful like Shammi Kapoor and Dharmendra, I don’t think some even had the decency to acknowledge the great man for their success. Even though Rajendra Kumar was amongst my favourite stars, I am yet to read or hear an interview where he has mentioned Mohd Rafi. I think after looking through the archives I found one interview where he mentioned Mohd Rafi for less than a minute. Yet everyone knows that a large part of his sucess was due to the music and songs of the films he starred in that Mohd Rafi did the playback singing for. Feeling saddened by this is an understatement. However, seeing and feeling the love and respect that Mohd Rafi still has by millions of his fans will always fill me with joy. Long may it continue as Mohd Rafi was, is and always will be the best ! Well said Shakeel ji, why bother at what Asha Bhonsle says or doesn’t say about Mohd Rafi. We all know the extent of jealousy that runs in the blood of Asha and her sister Lata. I think I’d be more surprised if the two had anything nice to say about Mohd Rafi, after all being sincere and being good human beings are not part of their nature. I just wish the two evil sisters would learn to respect the dead even if they didn’t respect people when they were alive! Let’s not bother whether Asha bhonsle admired Rafi saab or not. personally for me it matters little. Who cares for her comments. Rafi Saab is incomparable and far far ahead of her and her sister both as singer and as human being. Srinivasan ji, It’a hardly surprising that Asha Bhonsle speaks out against Mohd Rafi, let’s not forget whose sister she is. The two sisters who could easily play the roles of the nasty step sisters in a ‘Cinderella’ film. They need to learn to respect artists that have gained respect in their field and that for being a lot more talented then themselves. However, that is probably the problem (JEALOUSY). I’m disgusted that these people who never respected Mohd Rafi when he was alive due to their differences with him, should stoop to such low levels to talk ill of him now that he has passed away and can not defend himself!!!!!!!!!! Great article. I was recently listening to Asha Bhonsle on Vivid Bharti talking to one of the hosts (I forget his name) in a 2-part series. The host played two great Rafi-Asha numbers — Isharon isharon mein and Acha ji main hari. When he asked Asha for her comments, she first asked him sarcastically whether he was a Rafi fan. Then she proceeded to claim that she was able to put in variations on the songs which Rafi sahab could not do. She seemed to be hell bent on putting down the great Rafi sahab. However, the world knows who came out best in Rafi-Asha duets. The truth is, even in these two numbers, as in every other duet, Rafi sahab completely outsang Asha. Really a shame that Rafi sahab has been denied the Bharat Ratna, probably due to the attitude displayed by Asha and others who must be in an influential position. Yesterday in a radio programme on vividh bharti, singer Alka Yagnik mentioned her favourite 5 songs/singers. She liked the songs of Lata, Kishore, Reshma, Kumar Sanu & her own song. She also mentioned Asha Bhonsale as her 6th favourite singer. Unfortunately, she did not mention anything about the great Rafi sahab. Soni Ji, a beautifully written article and I couldn’t agree more and to be honest I don’t think Mohd Rafi fans will ever forget those two faced individuals who back stabbed or turned their backs on Mohd Rafi when he needed their support the most. Had they not turned against him the 1970’s music would have been much richer for it and not been dominated with mediocre music and songs by Kishore Kumar. Those individuals names are etched on the minds of Mohd Rafi fans and will never be forgotten or forgiven. 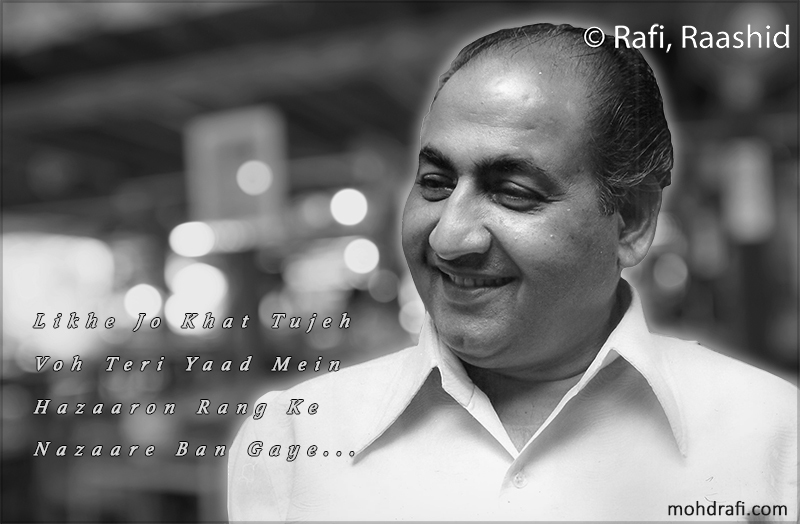 MOHD RAFI IS AND ALWAYS WILL BE THE BEST!!!!!!!!!!!!!! Dear Soni Ji, a brilliant article! I completely agree with you. Just saw a clip of Rafi Saab’s funeral, and noticed Lata, Yash Chopra (Dharmaputra song), Amitabh (Zanjeer song), Raj Kapoor, Randhir amongst others. People who were at odds with Rafi Saab during his lifetime and decided to use or support other playback singers, despite the massive contribution that Rafi Saab made to their careers. It was almost like they were cleansing their souls! Well written. Yes he is the best singer world ever had. Keep writing. Enjoyed it. Sonie, you should write more on Rafi Saab..I thoroughly enjoyed this article. of Mohammed Rafi since the early 50’s and your neighbor from Guyana. Dear Soni ji, you are truly a fan of Rafi Saab, your passion simply flows through your article! And Yes, many Actors – including a few who went on to become really big Actors, rode piggy-back on Rafi Saab’s voice. I believe that Rafi Saab was a better actor than many of the actors – his ‘play’ with words moved audiences then and moves listeners today – even if it is merely his voice on the Radio! I once had to travel from Ranchi to Jamshedpur – a 3 hour journey in a bs that was rattling so badly, that I was afraid it would fall to pieces. Until the driver slipped in a DVD of Rafi Saab’s songs. Just the Audio. Honestly, I did not want to step off the Bus at Jamshedpur, although I had heard all the songs in the DVD many, many times before! Such is the effect Rafi Saab has on you! What would Rafi Saab himself have done, watching these Videos of people from the Film Industry talking about him, if he could somehow see the Videos? I know that he would merely have smiled his wonderful smile, lifted his arms in the air and maybe muttered a short prayer for the person on the Video! Am I angry that Rafi Saab has not been conferred a Bharat Ratna or the Dadasaab Phalke Award, or a Lifetime Achievement Award? No, Honestly No! Why, you would like to know, I am sure! Well, because Rafi Saab was beyond Awards and recognition. Awards are for mortals, not for God’s Messengers! Mahatma Gandhi is considered the person with the greatest influence in the 20th Century. But, does he have a Nobel Peace Prize? The Bharat Ratha? No! Mr. Nelson Mandela, a devotee of the Mahatma, has both the Nobel Peace Prize and the Bharat Ratna. Does it matter? No again! The people who give away Awards will be remembered for a decade or two after their time on Earth is over. Rafi Saab will continue to mesmerize many more generations of listeners, whether he is awarded or not! Ohh sorry I forgot to mention the four parameters. They are RANGE, MELODY, DICTION & CLARITY. The Almighty has blessed only Rafi sahab with these vital parameters. Rafi sahab was GOD SENT. Tahstw hy he had the four important parameters in his voice. Vocal Chord is not a man made component inside the human body. Its gifted by the Almighty. The Almighty has so far blessed only one human being by giving him this specially architectured one which has all the above four factors. Thats our most Respected, Honored & Loved Rafi sahab. I always address him as ‘ FARISHTON KA FARISHTA ‘ . If you can see the funeral procession of Rafi sahab on the 31 st July 1980 , you can see lakhs of people irrespective of Caste, Creed & Religion are following the procession of his final eternal journey on the roads of Mumbai. There was heavy rain. Still people dint care. They were getting drenched totally but never bothered. They all would have definitely excited to follow him for they can give their offerings to this FARISHTA this way at least. This FARISHTA was himself a big PERFUME in the recording studio. I heard that when Rafi sahab used to enter into the studio the fellow musicans waiting for him used to say aloud with utmost happiness ‘ RAFI SAHAB AAGAYE ‘ These words were from their deep within. This can happen only with a DIVINE INCARNATION. Thats our Rafi sahab. RAFI SAHAB ZINDABAD.